I love this question, Lisa! It’s a topic I think about a lot. My mother was actually really good at this. When I was 6 years old, we moved into a new house and my mother, who could see I already had an interest in design, encouraged me to decorate my room. But it wasn’t sky’s-the-limit. Instead, she guided my choices. She narrowed the wallpaper options down to 5 she knew were good-looking (and at the right price point) and I could pick from those. I picked rainbow. : ) She did the same thing with the light fixture and the bedding. It was a great way to let me participate, and still determine a successful outcome. What about you, Dear Readers? 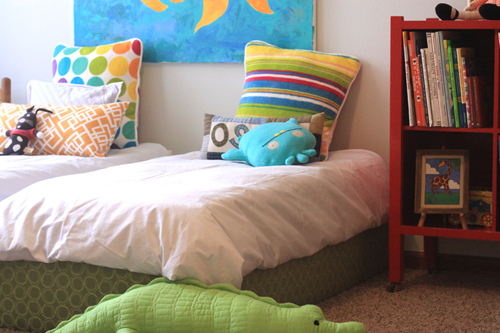 Do your kids like to decorate their rooms? How much freedom do you give them? I recently let my 4 year old son help re-decorate his room at the same time we were doing the nursery for his baby sister. I did a similar thing of providing a few choices and letting him sign off on some of the decisions. He chose a space theme and I picked out this bedding http://www.landofnod.com/family.aspx?c=7&f=3992 for him and let him give his stamp of approval before I bought it. Then we jointly decided that we would paint the walls blue. He told me he wanted the walls to be the color of Neptune and the ceiling the color of Uranus (he’s *really* into space). I did my best to accommodate and although I wouldn’t have picked such a bright blue for the walls myself (and 4 coats! ), I have to give him credit for the turquoise ceiling which is a stroke of genius and looks fantastic. I picked the rug and other details that he didn’t care much about, and let him pick some prints for the walls from some selections I presented him. I think it came together really well and the most important thing is he LOVES it. It’s all just temporary in the grand scheme of things, so why not let them have some say in it? Re: Lisa’s question about children’s artwork, how about getting some of those frames that let you swap out the pictures easily and put those in easy reach for her? Or do a clothesline-type gallery area on one wall so you can swap things out? I think the bright colors and bold designs of kids’ art would be a great inspiration for the room. The room sounds lovely, Rebekah! And I love the artwork ideas. Thanks for chiming in. I think it would be wonderful to have kids pick the paint colors. I grew up with white walls, and when I was finally old enough to choose colors for my own place, I had no experience to draw from. I was so worried about making a mistake that I still have white walls. My little sister on the other hand has yellow walls and a blue ceiling and she loves it. I’m a bit jealous of her experience. That’s a great point, Angel. Trying colors and surviving mistakes can build confidence for later in life. I think kids should be able to participate in design choices for their rooms. My kids and I have worked together to make choices for the decor in their rooms. I am currently making a quilt for my eight year old son’s bed, and he helped me choose the fabrics for the quilt. I’ll bet the quilt is beautiful, Erica! My DS is 2, so we haven’t reached this yet. Reading Rebekah’s comment about having her son ‘sign off’ on some design decisions sparked an idea for me – To draw up (on the computer or by hand) an ‘approval’ sheet with the details of the decision or choices, along with a spot for the child to indicate their preference with an x and a spot for them to sign (or print) their name – even a squiggle if they can’t write yet…some way to give their literal stamp of approval. For a kid big on ‘doing it / deciding themselves’ this could be a big hit. I imagine that my son will definitely want to decorate his room as he already colours with intent and directs everything he asks me to do from lego building to drawing. He comes by it honestly as I work in design. I spend much of my days approving our partners designs to ensure they reflect our brand but also their needs and ideas. It’s a fine line, but I feel pretty prepared for when I will need to do this with my son. I think Gabrielle has it exactly right in guiding choices and giving limits. Which, really, works well for adults too ;). If there are any chances to work in ‘choose whatever you like’ options (like a theme for a room), I’ll try to provide that to my son as sometimes it’s fun to come up with something completely on your own, and to not have an adult limit you. Another area this could be done would be to have your kid create an inspiration board. This way you could use it as a jumping off point for design ideas, respect some of your kids input, and quietly pass over anything you think is not appropriate. As you can probably tell, I can’t wait to do this with my son! I love the signing off idea! And love your enthusiasm too. I love the idea of having a rotating gallery of the child’s art on the walls. You could use a wire with little metal clips so they can easily be displayed and swapped out. This is fabulous. You’ve made me want to inspire creativity in my children. I let my daughter pick out a color scheme for her room last year, when she was just turning 6. It’s cream, pastel pink, and a light lime green. I maintained veto power, but I let her have as much choice as I could. She’s the one that has to live in it!! She also has a rotating selection of art work on the walls — we just use push pins or that blue sticky tac. I do, though, recommend making the expensive, long term items very neutral and letting the child’s choices be the things that are easy or cheap to swap out. A gallon of paint or a throw pillow is pretty cheap — Carpet? Not so much! My four year old daughter has stuck her artwork all over the walls of her room. I gave her some of the stuff I call ticky-tacky (I don’t know what the real name is, but it’s the removable gray putty-like stuff that teachers use to hang posters and such) and she can put things on her walls and take them off at will. She also has some fairy “clings” that she can put on and take off of her walls. I chose the furniture, the bedding, and the “color scheme” of her room when she was 2 1/2, but it’s definitely HER room! Thanks for the smart answer to my question! I am going to get some paint chips and let her pick from some pre-approved colors – then maybe go down a shade or two! I love the idea of swapping out the art work in frames, so there is still organization and balance in the room. My daughters have been pretty pleased with the design of their room so far. I did give them a heads up on a major change I plan to make to the paint and colors over the next few months. I’ll let them be more involved when they move into separate rooms, but that’s a few years away. I agree with the rest of the commenters- furniture and long-term decisions should be guided by the parents. I absolutely advocate for giving kids power over creative decision. I agree that parents need to help guide kids to see the bigger picture of what their choices will amount to, but my son is always THRILLED when I ask him to choose — whether it’s new clothes at the store, fabric for recovering some chairs in the dining room, or a birthday gift for one of his cousins. And I LOVE seeing his pride (the good kind) and confidence grow. He is definitely a character and I am happy to encourage the development of his personal taste. I might have to reign in his choices from time to time, but we always find something that makes us both happy. My policy is that my 7-year old daughter can decorate any way she chooses but she is responsible for keeping it picked up (within reason) and making her bed. The sky is pretty much the limit but she is not allowed to harm any furniture. Do I like the way her room looks? Not at all. Whenever we have company she immediately wants to show off her room and describes it for friends when we are away. bright, graffiti-inspired pieces of art. I highly encourage creative freedom with limited choices. Win-win. My 8 year old son and me actually looked at examples for ‘cool boys rooms’ all over the internet. We both only liked one room, which had waves painted on the walls in 4 different shades of blue and turqoise. it turned out great, and we both love it. As he is drawing alot, we have tons of art, but we both decided -instead of hanging it on the wall- to take photographs of the nicest ones and print a book from them on http://www.blurb.com (which will be the christmas present for the grandparents!) and painted a part of the wall with chalk paint, so he can let his creativity out there. My 4 year old daughter has a clothes line (rope with clothes pins) on one of her bedroom walls that we put her artwork on. She decides what stays and what goes and she is proud to hang up her work. It’s quick and easy to change out the art and she has a sense of control of her room decor. I’ve been thinking of something like this…thank you so much for commenting…any tips? We just moved into a new house and we let our 3 kids(10, 8, & 5) pick the colors for their bedrooms and bathrooms. We gave them some direction and let them pick btw a few colors and the choices they made are terrific. We are now in the process of letting our 10yo & 5yo pick the beds for their rooms. Haven’t found the right ones just yet, but hopefully soon. I can’t wait until my June is old enough to decorate! She’s 2.5, so we have a ways to go. Right now we just make granola together. That seems to be a perfect 2.5 year old mother/daughter cooking activity. I love this! I’d just use non-VOC paint so it’s not constantly emitting chemicals long after it’s dried. This blog i great providing the decorative ideas for our room bedding or furniture in the right place. The Custom Bedding available in several varieties with reasonable prices. My little girl was only three when I last redid her room. She wanted a princess room, of course. I ended up letting her have a pink room. I had thick ornate trim made into large custom shaped shadow boxes with a delicate pink striped pattern inside them. That way the finished effect didn’t feel like you were drowning in a Barbie pink nightmare. We chose a toile bed set from Whistle and Wink with matching valances. And I had pink ribbon sewn around the edges of black-out curtains to make them look like Pottery Barn curtains. If only Pottery Barn made black-outs in that style, but I think the price was pretty comparable having a tailor sew on the ribbons. The most fun part was choosing lamps together. The one we finally chose with a pink shade and hanging pink and blue crystals required some assembly. It was the perfect finishing touch on a room we now both enjoy spending time in!